A hunt is on to find up to seven statue heads that once stood in front of an Oxford landmark. The carved figures known as the Emperor Heads, outside the Sheldonian Theatre, were first commissioned by Sir Christopher Wren in the 1660s. The current set is the third and it is thought as many as 27 "retired" emperors could still exist. A team from the University of Oxford has located 20 but wants to trace them all to study how they have weathered. Although they are often referred to as the Emperor Heads, it is not known what the statues represent. Scott Allan Orr, from the School of Geography and the Environment, said they wanted to understand how the figures have eroded in order to improve conservation efforts for similar carvings. Some of the retired heads can be found in the grounds of Wadham College and Worcester College in Oxford with others at Harcourt Arboretum, Oxfordshire, and a north Oxford school. One figure from the first set, commissioned by Wren, has been traced to the garden of a home in Oxford and Mr Orr thinks some undiscovered heads could also be in private hands. The team has asked people who believe they have one of the missing statues to get in touch by contacting Prof Heather Viles. They are also working with the University of Oxford's Bodleian Library on plans to display some of the heads opposite the Sheldonian Theatre at the Weston Library next year. 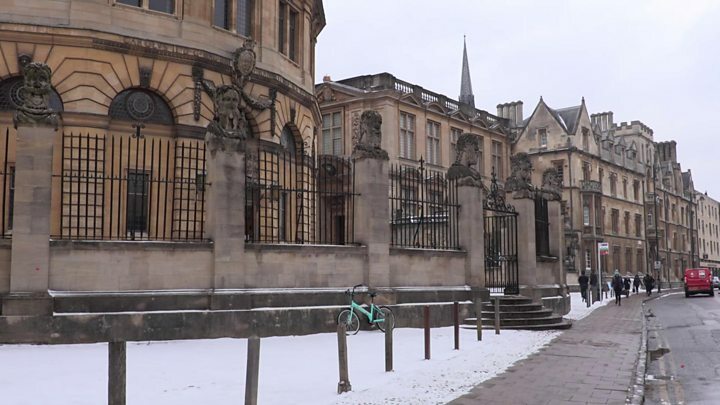 Video What has happened to Oxford's retired emperors?